DESCRIPTION: "Searenity" in Seagrove Beach is a stunning five bedroom, four bath newly renovated home located a short three minute walk to the beach! With room to sleep 15 comfortably, there's ample space to bring the whole family. The master bedroom with private ensuite bath is conveniently located on the first floor as well as an additional king guest room, also with an ensuite bath. A second king guest bedroom is located on the second floor. Upstairs on the third floor is a bunk room, perfect for kids or teenagers, with three twin-over-twin bunk beds and a shared bath. 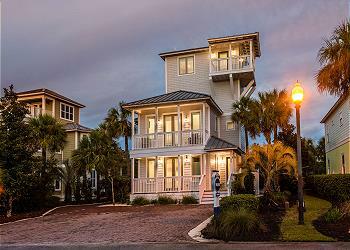 The fourth floor boasts Gulf views and the final guest bedroom with a queen bed and twin sleeper. Guests will love the proximity of this house to the water and the bikes provided with the property to explore the community! A heated community pool is nearby for extra fun in the sun! AMENITIES INCLUDE: 5 adult bikes provided, gulf views, Complete Clean Linen Participant - ALL linens, including comforters laundered upon every checkout. Beautiful home with thoughtful and practical touches for multiple occupants. We enjoyed our stay and had a wonderful experience! We are so glad that you enjoyed your stay with us in Seagrove! Thank you for staying with 360 Blue, we look forward to hosting you again soon! Thank you 360 Blue! 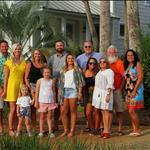 Our 2018 family vacation was the Best Ever! The rental house was amazingly beautiful. The property was super clean and had everything we could have ever needed! Location to the beach was great! Very short 5 minute walk and the bike ride was less than 2 minutes. We had a group of 12 and never once did we feel crowded. My family has already asked me to book this property again next year. See you next summer! Thank you Willis family! It is our pleasure to host your family vacation and we are so delighted that you all enjoyed your stay with us! The family photo you shared is priceless! We agree that this home is a great option for larger groups and families and the location is tough to beat! We can't wait to see you all again next summer! Beautifully done home. More than enough room for our family of 5 adults. Close to beach and we really enjoyed that is was off from all the crowds. Recommend simple instructions for the dishwasher as it took a few attempts to finally get one load to finish. Upstairs ac was not working and we were provided with a swamp cooler to help with the heat. While this was a fix for the problem the noise level was excessively loud and could be heard throughout the entire house . Overall our trip at 33 Dunes was very nice and we very much enjoyed the home. But do feel something more should have been done for the ac sound issue. We had a great time. The house was really clean and beautiful. The kids loved the bunk room with the smart TVs in every bed and the loft room was a great hangout for the teens. Since we were 3 families, having one master bedroom with the amazing bathroom was a little problematic. The other bathrooms were much too small for couples. We had to flip a coin. It’s no big deal, but I think this house is better suited for one family rather than a few. Beach access was great! We loved the bikes- again there weren’t enough for all the families, but we made it work. The upstairs AC never really worked well and nobody came to fix it, and the dishwasher never worked right, we had to hand wash everything. But overall an amazing experience! Thank you!!! We are glad you enjoyed your vacation in spite of a few issues during your stay. We apologize for the AC issue, however, we do show that a technician did come by to confirm that it was working but due to the duct work the doors on the 3rd level would need to remain closed in order to cool. The homeowner is aware of the issue and we are currently working with them to hopefully rectify this once and for all. We are at their mercy since these homes are privately owned. In regards to the dishwasher, we were never notified of this issue and would have been more than happy to schedule someone to come by to fix. In regards to the bikes, we only supply one per bedroom. We would have been happy to rent additional bikes to you for everyone to use. We will be sharing all of this feedback with our team and we hope you are able to come down to the beach again soon! We absolutely loved the house! Everything was beautiful, new and very clean. We had 10 adults and 2 toddlers and there was plenty of space for everyone to spread out. We loved that the family room was large enough to accommodate all of us. The modular sofa was probably our favorite feature. Fantastic kitchen & comfortable beds were a major plus. Convenient beach access. Great customer service when I called before & during our stay. The super easy checkout was wonderful! We would love to stay here again! We are so glad that you enjoyed your vacation with us! 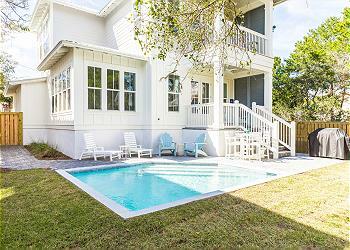 We agree that this home is perfect for a fun beach getaway and is very accommodating for large groups! We look forward to hosting you all again very soon!